Whereas the Galaxy S7 is the new race horse in Samsung's stable, the Galaxy S7 edge is a new breed of awesome. Tricked out with curved glass from all sides, a bigger screen and a larger battery, the S7's bigger brother is bound to turn more than a few heads. It could even steal some glances from the Galaxy Note 5, which has been on the market for six months and is still among the hottest large screen phones. Traditionally, Samsung's S series have been the ones engineered for mainstream appeal, while its Note series are the testbed for experiment with power user features. While neither the Galaxy S7 edge or the Note 5 can be described as groundbreaking, they are still among the finest smartphones Samsung has ever produced. Although you can't go wrong with either, you'd be forgiven if you can't decide between the two, given they are large screen phones packing cutting edge technology. That's why we have a preliminary comparison ready for you, complete with our personal impressions and opinions on which one will make more sense for you. 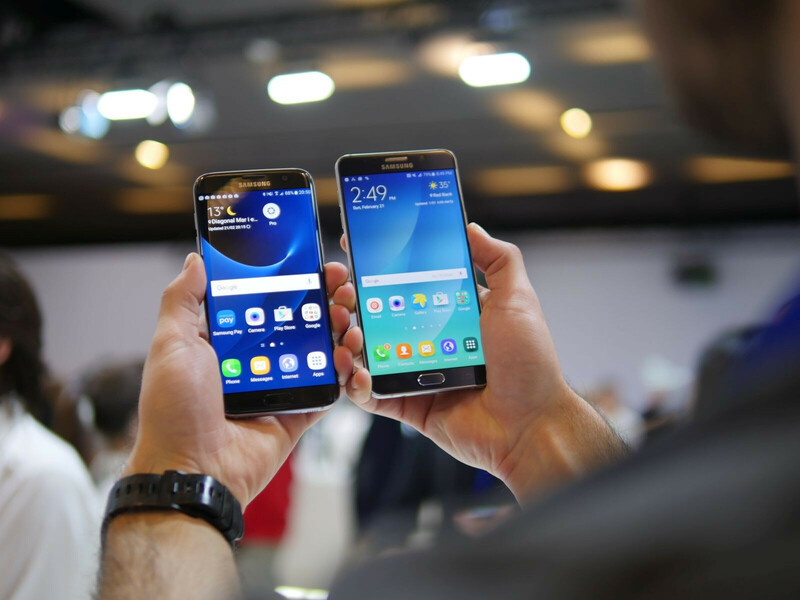 Both smartphones feel solid and absolutely premium, but the S7 edge is more reasonably sized. 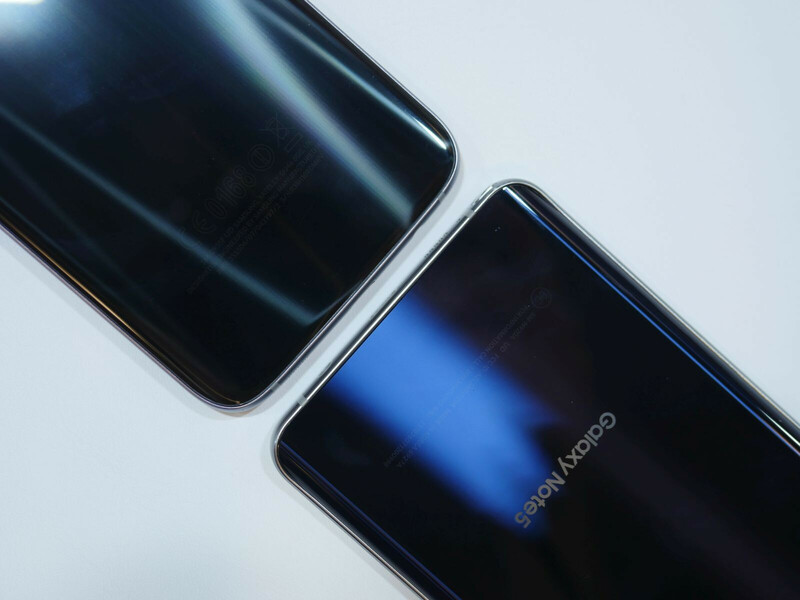 Being the iterative upgrade that it is, the Galaxy S7 edge doesn't look much different than its predecessor, but the iterative changes help to move the design forward. Samsung actually took a design decision from the Note 5, transplanting its curved glass back on the S7 edge to make it feel better in the hand. Additionally, the smartphone is very reasonably sized for a big screen handset, making the Note 5 feel rather massive next to it. Still, we can easily say that both smartphones feel solid and absolutely premium. Both have elegant metal bezel trims and are covered in scratch-resistant glass. The S7 is a little bit easier to operate one-handed, as it has a smaller footprint, while the Note 5 almost makes two-handed use a necessity. Weight-wise, both devices feel substantial. They are sold in a conservative selection of colors – Black, Gold, and Gray. While all too familiar, the color variants do look nice and classy, and the way the light plays off both smartphones' metal and glass bodies is just fancy! However, the S7 edge has an advantage over the Note 5 in that the handset is rugged. Being IP68-certified means the phablet is dust-tight and can be safely submerged into water 1 meter deep. The Note 5 has no such superpowers, so you'll have to pamper it, or get the bulkier Note 5 Active. Being rugged is one thing, but rocking a pressure-sensitive stylus is another level of cool. The Galaxy S7 edge doesn't have such virtues, yet the Note 5's S-Pen is a prime example of productivity-oriented functionality. The S-Pen is hidden away along the lower right corner of the phone. Press down on it slightly, and the non-business end of the S-Pen pops out of the slot. Take it out for a spin and enjoy the special S-Pen features – writing with the screen off, Air Command, Write on PDF, and Scroll capture, among other things. That aside, both handsets have fingerprint sensors for biometric security, heart rate sensors, wireless charging and rapid charging. Samsung's latest AMOLED displays are the best the industry has to offer, and the Note 5 offers a little more. Samsung's latest AMOLED displays are the best the industry has to offer, and neither the Galaxy S7 edge, nor the Note 5 are exceptions to the rule. Both are very sharp with their Quad-HD resolution (1440 x 2560), and size-wise, the one on the GS7 edge is 5.5 inches, while that on the Note 5 is 5.7 inches by diagonal. The S7 edge's display has a notable feature to differentiate it from the Note 5, and that's the Always On display. When it's in your hands, the S7 edge constantly keeps some of its ights on in order to show you important info, such as the time, notifications, and appointments. The best part is that this is supposed to help with battery life, as users turn on their screens up to 200 times a day just to check the time. The Note 5's display can't pull off such tricks, but it is bigger than the S7 edge's, and has the ability to receive input from Samsung's pressure-sensitive stylus. Although the core user experience is essentially the same, the Note 5 is better suited to multitasking. At this point in its evolution, Samsung's TouchWiz interface feels coherent enough on the Galaxy S7 edge and the Galaxy Note 5. Both handsets run the latest version of Android, which is 6.0.1 Marshmallow at the time of writing. 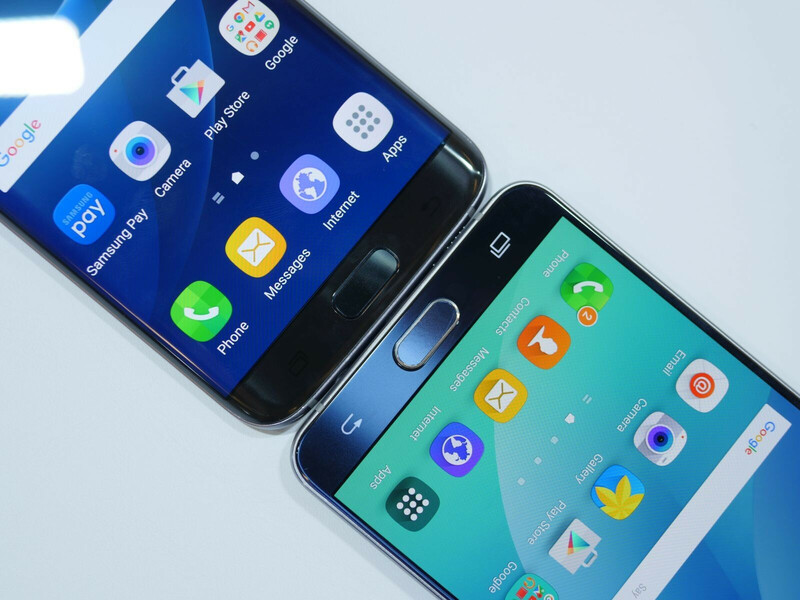 Although the core user experience is essentially the same on the S7 edge and the Note 5, the latter is better suited to multitasking with its slightly larger display and the extended functionality allowed by the S-Pen, which is very convenient for juggling information between apps. Still, the S7 edge is able to hold its own in terms of productivty, as Samsung hasn't stripped side-by-side multitasking off its Android build. It also comes with its own special edge UX. The edge panel houses various shortcuts and offers the macro feature, which lets you automate functions such as opening the camera and then switching to the front-facing camera to snap a selfie. The edge panel might be novel to some, but it’s there for the convenience of users who actually use it. The Galaxy S7 edge is graced by the latest achievements in mobile computing, while the Note 5 uses Samsung's best technology from last year. Although both smartphones are very capable handheld computers, the Galaxy S7 edge is a more recent device graced by the latest achievements in mobile computing, while the Note 5 uses Samsung's best technology from last year. In America, the GS7 edge is powered by the Qualcomm Snapdragon 820 processor, which boasts four custom 64-bit CPU cores, a powerful Adreno 530 GPU, and LPDDR4 RAM. Outside the US, some variants of the handset will run on Samsung's own Exynos 8990 chipset, which is 30% faster than the Exynos 7420 processor in the Galaxy Note 5. Both devices have 4GB of fast, power-efficient LPDDR4 RAM each, and feature 32GB of crazy quick UFS flash storage. However, the S7 edge's memory can be expanded via microSD card, while the Note 5 doesn't offer such facilities. Either way, most users won't notice a major difference in how the smartphones handle, because they are both very fast, even though the TouchWiz user interface can be prone to lag and stutter. Raw percentages aside, both devices are powerful enough to handle whatever you throw at them, and have power-efficient chips and displays that let them make the most of their capacitious battery cells. They also provide very good battery life. The Note 5 lasted 9 hours and 11 minutes of constant simulated on-screen use, and chances are the Galaxy S7 edge will beat its record, thanks to its newer chip and significantly bigger 3600mAh cell. Of note to mobile gamers, which are probably eyeing Samsung's handsets for their beautiful displays and sheer horsepower is that the Galaxy S7 edge supports the Vulkan advanced graphics API, which lets game developers tap into the raw potential of the device's hardware for visceral effects and faster performance. Speaking of games, the new Game Lounge app on the GS7 edge unlocks some cool options for gamers, such as gameplay footage recording, easy notifications dismissing while gaming, and additional performance optimization. The Note 5 already takes excellent photos, but the Galaxy S7 edge promises improved sharpness and illumination. Samsung has always insisted on strong, capable cameras for its flagship smartphones. 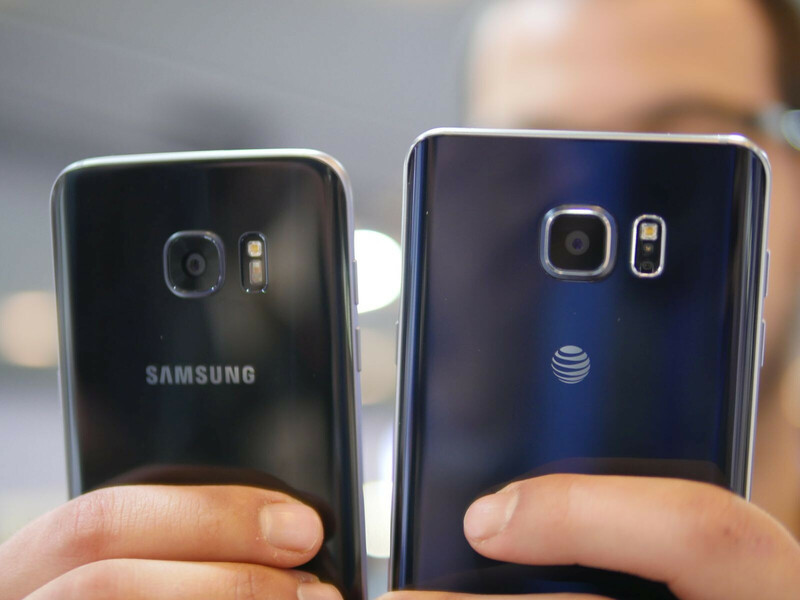 Last year, the Note 5 presented a strong foundation to improve upon with its 16-megapixel rear camera. Its sensor is 1/2.6"-big, with 1.1 micron-sized pixels, and the setup is complete with an LED flash and f/1.9 aperture lens. While this setup is still capable of taking some of the best photos around, it still offers room for improvement, which Samsung took advantage of for the Galaxy S7 edge. The new smartphone rocks a 12MP rear camera, which may be smaller in resolution, but makes up for that with 1.4 micron pixels, bigger than those of the Note5's sensor. This lets them soak in more light, up to 56%, according to Samsung's estimates. Moreover, the camera is equipped with dual photodiode technology for quicker auto-focus. Instead of each pixel site comprising a single photodiode for image capture, the Dual Pixel CMOS sensor allocates two photodiodes for every single pixel site. This makes focus quicker and more accurate, both for photos and video recording. Speaking of videos, both handsets play and record footage in resolutions up to 4K without a hitch. On the front side of things, both the Note 5 and the GS7 have 5MP selfie cameras, capable of capturing face and group shots with their wide angle lenses. Yay! 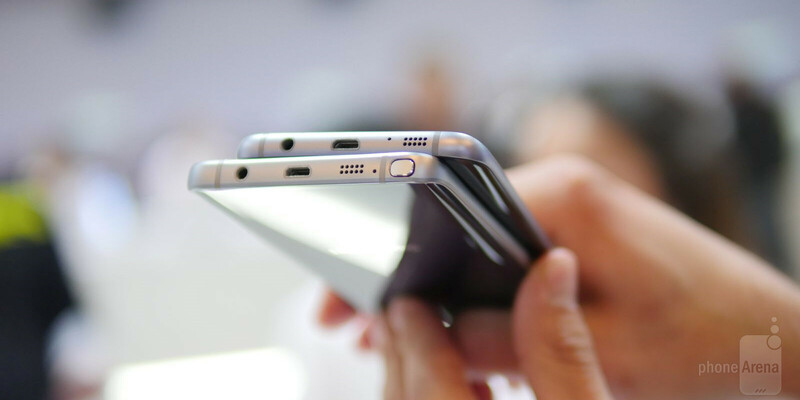 At first glance, choosing between the Galaxy S7 edge and the Note 5 is a matter of determining a few simple things. Thus, we expect users seeking enhanced productivity to get the Note 5 for its S-Pen and bigger display. It's barely six months old, and it's still a smoking hot piece of recent phablet history! If you want expandable storage and look forward to playing Vulkan-enhanced games, though, pick up the S7 edge. The latter also has an improved camera that promises sharper and better illuminated photos, regardless of the shooting conditions. We can't claim this for certain until we have compared camera samples of the two smartphones, but looking at the S7 edge's camera on paper, the smartphone clearly has what it takes to pull off better photos than the Note 5's already great cameras. Otherwise, both devices are beautiful, excessively powerful showcases of the best mobile technology Samsung could ship at the time of their release. Like we said early in the beginning, you can't go wrong with either! 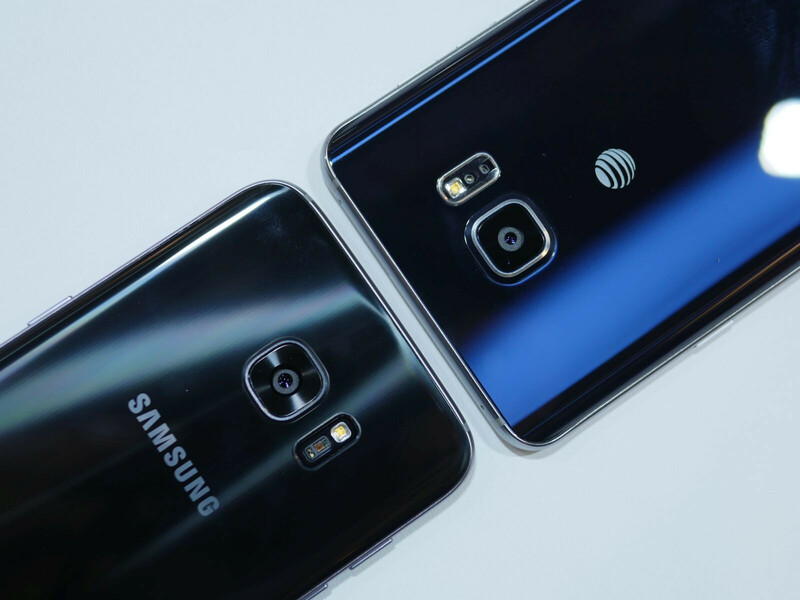 Samsung Galaxy S7 and Galaxy S7 edge - New features Another curious detail is the added support for Dual Pixels. A first in the smartphone world, Dual Pixel is a technology borrowed from dedicated cameras that allow for faster focusing by combining information from two pixels on the camera sensor. Samsung's flagship sports wider aperture (F/1.7) and larger pixels which could translate to greater performance in low light. The flagship device includes new camera features such as Motion Panorama and Selfie Flash, to provide an entirely new phonetography experience. For starters there's Motion panorama which captures the moving subjects in the panorama, instead of just butchering them in the stitching process - it's like a panoramic video almost. Another feature, Motion photo, captures a three-second video before you've pressed the shutter - it also allows you to preserve a still photo. The built-in Hyperlapse mode is a first on a Samsung cameraphone as well, and it is a great add-on that makes digitally stabilized time-lapse videos. The new processors in the Galaxy S7 phones boast high performance but will also run cooler, using a "tube" that helps keep the phone cool in your hand, "Thermal spreader" Water-cooling technology to avoid the phones overheating. 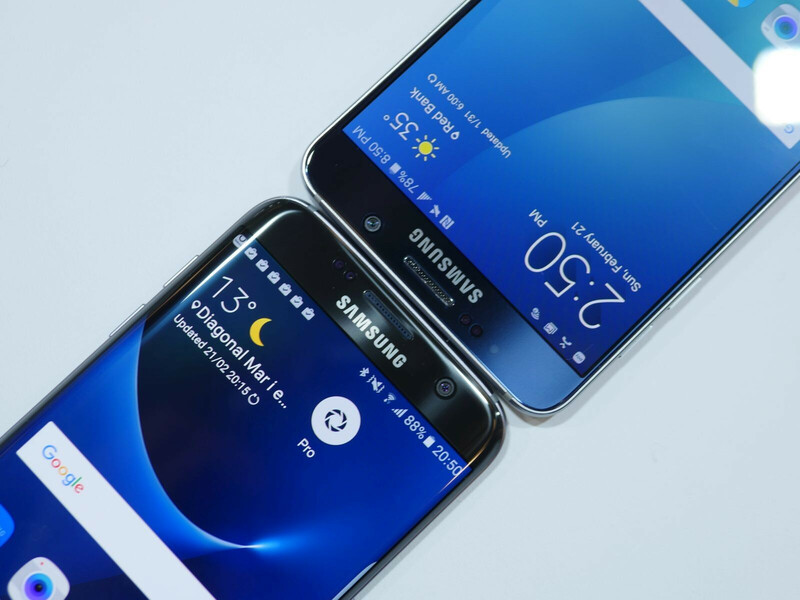 Galaxy S7 Has Gaming Features, Graphics Tweaking. Samsung “Game Tools” Dedicated gaming feature makes it easier to record sessions and screenshots; a do-not-disturb mode blocks incoming notifications. The S7 also supports the Vulkan API for game development. You don't need to care about the details, but what it means is that many new games are coming soon to take better advantage of modern multicore processors. The S7 is ready to support these games, and when they arrive they should look and play much better than almost anything you've seen on Android before. Samsung also offers the ability to tweak graphics performance between three settings so you can dial things back a little if you want to put battery life ahead of gameplay. The standard setting will run games at maximum resolution and at 60 frames per second. The "low power" setting reduces frame rate to 30 frames and dials down the resolution somewhat, while "extreme low power" sticks with 30 frames but drops the resolution again. The Exynos 8 Octa also integrates the most advanced LTE Rel.12 Cat.12/13 modem for cutting-edge speed in connectivity. It offers downlink speed of up to 600Mbps (Cat.12) and an upload speed of up to 150Mbps (Cat.13) with carrier aggregation, which will transform mobile user experience. Just 1 option missing. They should've gave the option for the Cpu to have settings like: power/standard/saver. The S7 is running at standard, when using power mode it overclocks the whole Android frame and Cpu,Gpu, and voltages. This function is available on inteli5 and Intel i7 socs. Note 5 is better due lower price. The Note starts at $699 The S starts at $599 on Verizon. Which one is lower? Price drop expected. It cost 600 on amazon. I never understood why you compare the S to the Note. They aren't the same phone. They are in a totally different category. The S should be compared to the Xperia Z, or HTC M(x) or iPhone or similar. The Note is in a category nearly all by itself. AM I THE ONLY ONE.... who noticed they recommended us to get a non existent phone in the "Note 5 ACTIVE" which unless i'm that out of touch, doesn't actually exist lol. They even called it "Bulkier" like there is one to be able to make that claim. maybe PA knows something we dont. Id love a note 5 active. If note5 active was released, I'd sell my note5 instantly. Same here, just hoping for a bigger battery and rugged design better than the horrible physical buttons on the S6 Active. I've just pre-ordered the black S7 Edge this morning and will get it in week 10. :-) And I get a VR-set as a bonus for pre-ordering!
" NOTE 5 ACTIVE" - The author suggests to get this mythical "Note 5 active" toward the end of the second last paragraph in the "design" section of this article . Claps !! Is there any word on if there's a force touch like feature? The Note 5 is the king. The S7 Edge had better bring the noise. Samsung, please bring IR blasters back to your flagships. Note 5 already a beast. Note 6 must be another beast later this year with at least 3600mah, expandable memory, water proof, better camera, and last but not least more advanced S Pen. Can't wait. What will make Note6 better than S7 Edge? 128GB-256GB UFS 2.0 storage, 4000mAH battery, and 5.7" screen. Now that's what I call a perfect phone!